Christine Kenyon Jones (email: christine.kenyon_jones@kcl.ac.uk) is a Research Fellow in the Department of English at King’s College London, where she teaches a course on Austen. Her publications include Kindred Brutes: Animals in Romantic-Period Writing (Ashgate, 2001) and Byron: The Image of the Poet (AUP, 2008), which considers visual aspects of Byron and Byronism. This article traces the possible links between a portrait of two members of the family of the famous eighteenth-century Judge, Lord Mansfield, and Austen’s Mansfield Park.1 It suggests that this portrayal of unequal cousinhood, within the context of the slave trade, may have influenced Austen’s treatment of these subjects in her novel. 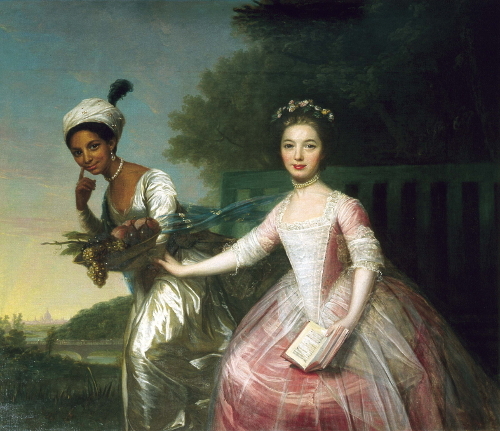 Portrait of Dido Elizabeth Belle and Lady Elizabeth Murray. Reproduced with the permission of the Earl of Mansfield. Painted in the late 1770s by an unknown artist, the portrait shows two great-nieces of Lord Mansfield, who was Lord Chief Justice of England from 1756 to 1788. On the right is Lady Elizabeth Murray, daughter of Lord Mansfield’s nephew and heir, the seventh Viscount Stormont. Lady Elizabeth was born in 1760 and brought up by Lord Mansfield and his wife after her mother died when she was a young child. Dido Elizabeth Bell, on the left, was the illegitimate daughter of another of Lord Mansfield’s nephews, Captain John Lindsay, and a probably enslaved black woman, Maria Bell. Dido was born in 1761 and was also brought up by Lord and Lady Mansfield from a young age. The girls are shown in the grounds of Lord Mansfield’s house, Kenwood, in Hampstead, North London, and there is a representation of Kenwood’s famous view of St. Paul’s Cathedral in the bottom left-hand corner. The painting is now kept in Scone Palace, Perth, Scotland, but it was displayed at Kenwood in 2007 in an exhibition marking the two-hundredth anniversary of the abolition of the slave trade in Britain (“Slavery and Justice”). There are several points that link this painting with Austen. The first is the well-known suggestion that the title of Mansfield Park refers to Lord Mansfield and his famous verdict of 1772, in which he ruled that a black defendant, James Somerset, could not be taken against his will back out of England and returned to slavery in the colony of Virginia.2 The “state of slavery . . . is so odious,” Mansfield ruled, that “[w]hatever inconvenience . . . may follow from the decision, I cannot say this case is allowed or approved by the law of England; and therefore, the black must be discharged” (White 1). Although in giving his ruling Lord Mansfield made it clear that he intended it to apply only to James Somerset, in fact the judgment was widely interpreted to mean that all enslaved people in England must be “discharged,” and it gave great momentum to the movement for abolition. Several people at the time remarked on the probable influence that Dido’s presence in the Mansfield household might have had on her great uncle’s decision. For example a “Jamaica planter” is recorded as predicting before the trial that “no doubt” Somerset would be set free, because “Lord Mansfield keeps a Black in his house which governs him and the whole family” (Hutchinson 2:276). In fact, however, Mansfield’s legal opinions and rulings in this and other slavery trials suggest that he was torn between his deep revulsion against slavery and his reluctance to establish legal principles that he knew would sweep away the entire system of slavery and wreck the economics of the plantation system. Mansfield encountered slavery in at least seven litigated cases (Oldham 62), one of which was that of the infamous slave ship Zong, from which one hundred thirty-two enslaved men, women and children were thrown overboard and drowned so that the owners could claim compensation. After originally awarding the insurers £300, Mansfield decided a human being could not be insured, and called for a retrial. The slavers and insurers withdrew their case, and from then on it became impossible to insure enslaved people. The second point that connects this portrait with Austen is that Austen knew Lady Elizabeth personally in her later life, after she had married and become Lady Elizabeth Finch-Hatton. The two women’s meetings are recorded several times in Austen’s letters between 1805 and 1813 when the Finch-Hattons were neighbors of the Edward Austen (from 1812 Edward Knight) family in Kent. It seems from Austen’s comments that she was aware of Lady Elizabeth’s ancestry and origins, and was disappointed not to find her a more interesting person or more forthcoming in conversation. On 24 August 1805, for example, Jane reported to Cassandra: “I have discovered that Ly Eliz:th for a woman of her age & situation, has astonishingly little to say for herself, & that Miss Hatton has not much more.” Subsequently the taciturnity of Lady Elizabeth and her daughters became a running joke between the Austen sisters (see 30 June-1 July 1808; 26 October 1813, and 6-7 November 1813), and it has been suggested that Lady Elizabeth may have been the model for the “elegant but dumb” ladies in Austen’s fiction, including Lady Middleton in Sense and Sensibility, and of course Lady Bertram in MansfieldPark (Lawrence). The third way in which the portrait seems to link with Mansfield Park is the way in which the two girls’ cousinhood both emphasizes their similarities and delineates their differences, just as Fanny’s relationship with the Bertrams does. Like Fanny, Dido occupied an ambiguous position in the family. On the one hand she received the advantages of comfort, wealth, and education that only membership in an aristocratic family could bring. But on the other hand Dido, like Fanny, was a poor relation whose status in her Mansfield household was unregulated and totally dependent upon the good-will and affection of those around her. Dido, of course, suffered from additional social disadvantages that do not apply to Fanny. She was illegitimate, and she was of mixed race, the daughter of a probably enslaved woman. In late-eighteenth century England Dido’s illegitimacy seems likely to have had more effect on her status than her skin color, which evidently gave her a certain exoticism that is exploited in the portrait. This distinction is borne out by the way Austen presents the only person of color in her fiction: the seventeen-year-old West Indian heiress Miss Lambe, of Sanditon. Miss Lambe exists only as a tiny sketch; she is first described as “‘a young West Indian of large fortune, in delicate health’” (200), and it is only later that we learn she is “half-mulatto” (202). Miss Lambe’s skin color, or her race, does not prevent Lady Denham, the most socially conservative character in the book, from pursuing the young woman as a potential wife for her nephew. Lady Denham is said to “kn[ow] the value of money” (150) and is apparently willing to add a niece of mixed race to her family in order to get it. On the other hand, illegitimacy such as that of Harriet Smith in Emma, although it is viewed as romantically interesting by Emma herself, is a complete bar to any prospect of Harriet’s marrying the clergyman Mr. Elton, at least as far as he is concerned (142). Hutchinson is clearly a critical and racially prejudiced commentator, but aside from this there are several points stated or implied here which indicate the ambiguity of Dido’s status. First, Lord Mansfield seems to have disguised from the Governor the fact that Dido was his own great niece, and there is an implication that Hutchinson thought she was Mansfield’s mistress. Such a relationship would have been common in the West Indies at the time, of course. Secondly, although Dido’s relationship with the ladies of the house as described by Hutchinson is clearly an affectionate one—she walks arm in arm with one of them—we also note that she does not dine with them and does not join the company until after dinner. This may recall the careful social gradations in Austen’s Highbury, in Emma, between those who are invited for dinner and those who are invited “in the evening” (224-25), and Mary Crawford’s puzzlement, in Mansfield Park, about whether or not Fanny has “come out” and therefore dines in company or not (56). However, the fact that Dido’s manner struck the Governor as “pert” probably means that she was allowed to express herself with a freedom that seemed to him inappropriate. In this respect Dido is very different from Fanny, who is portrayed by Austen as much more docile, genteel and ladylike than her privileged female cousins. In contrast with Hutchinson’s account, the newspaper obituary for Dido’s father, published in 1788, reported that her “amiable disposition and accomplishments have gained her the highest respect from all his Lordship’s relations and visitants” (“Slavery and Justice” 5). Hutchinson was also wrong in supposing that Dido, like the slaves he was familiar with, had nothing other than a given name, although her nick-naming after the classical Queen of Carthage is typical of the dehumanizing way in which slaves were often denominated. She was referred to in her father’s will as “Elizabeth” and in Lord Mansfield’s will as Dido Elizabeth Bell [or Belle], apparently taking her mother’s surname (Adams 14). We also know that Dido, like Fanny, was given “work” to do of the sort that could be classed as a genteel hobby for eighteenth-century ladies. Where Fanny is sent on errands by Mrs. Norris, gathers roses and writes notes for Lady Bertram, and apparently does most of her Ladyship’s needlework for her, Dido, according to Hutchinson, was “a sort of Superintendent over the dairy, poultry yard, &c., . . . and she was called upon by my Lord every minute for this thing or that, and shewed the greatest attention to everything he said” (Adams 10). Dido’s superintendence of the dairy might have been in something the same manner as Queen Marie Antoinette’s, playing at farming, but more likely it was a real job that contributed in a practical and useful way to the household. She also acted informally as Lord Mansfield’s secretary, and a letter of 19 May 1786 from Mansfield to another judge ends with a note from Mansfield: “This is wrote [sic] by Dido. I hope you will be able to read it” (Oldham 67). The Kenwood accounts for 1789 show that Dido received over £30 during the year, in the form of an allowance and presents: several times the annual wages of a female servant, though much less than the £100 a year that was Lady Elizabeth’s allowance (Adams 13). In his will, moreover, Lord Mansfield bequeathed Dido £500 and the sum of £100 a year for her life, an amount that Austen would have viewed as probably not enough to ensure gentility, but substantial all the same. In Sense and Sensibility the three Dashwood sisters and their mother “‘will have five hundred a-year amongst them’” to live on, an amount on which, Fanny Dashwood disingenuously remarks, “‘Only conceive how comfortable they will be!’” (14). In his will Lord Mansfield was also careful to confirm Dido’s freedom, and noted that his bequest related to “how she has been bred and how she has behaved” (“Slavery and Justice” 5). Soon after Lord Mansfield’s death, in 1793, Dido married John Davinier, a gentleman’s steward, and in the next few years she became the mother of three sons. Her last known descendant was living in South Africa in the 1970s, and, ironically, under the apartheid laws he was classified as white (“Slavery and Justice” 11). The portrait was painted at around the time Governor Hutchinson visited Lord Mansfield, and we can see how some of this background is subtly reflected there. Described as “unique in British art of the 18th century in depicting a black woman and a white woman as near equals” (“Slavery and Justice” 4), it gives almost equal space to Lady Elizabeth and Dido, allowing them both to face us, smiling. The conceit seems to be that the artist has begun by painting Lady Elizabeth, who has caught Dido by the arm as she rushes past and drawn her into the picture as well. Both girls wear silk dresses and pearl jewellery, but Lady Elizabeth’s hair is dressed conventionally with flowers while Dido wears an exotic turban with a feather in it and carries a fine scarf woven with gold thread. While Lady Elizabeth wears two strings of conventional small pearls, Dido wears a single string of exceptionally large pearls. Such large pearls were, again, associated with the exotic: Cleopatra, for example, according to Pliny the Elder is said to have owned “two pearls, the largest that had been ever seen in the whole world” (9.58). Lady Elizabeth’s leisure and repose is shown by the open book she holds, while Dido’s errand, or work, is figured in the fruit she carries and the scarf flying out behind her. Perhaps the artist was aware, as Austen later was, of Lady Elizabeth’s rather passive nature and chose to contrast it with Dido’s liveliness; or perhaps a more pointed contrast is intended between their status respectively as leisured aristocratic lady and working (though exoticized) woman. Dido’s finger pointing to her cheek is a puzzling gesture: is it meant to draw attention to her skin colour, or simply to her smile and her dimples? All these elements serve delicately but carefully to delineate the relationship between these Mansfield cousins, and, I suggest, bring to mind the kind of ambiguously unequal cousinhood that Austen portrayed in Mansfield Park. The contrast between activity and repose, exemplified by the radically different dispositions of Lady Bertram and Mrs. Norris, and by Fanny’s physical weakness and inability to sustain the tasks Mrs. Norris imposes on her or to enjoy the energetic lifestyle of her cousins, is a frequent theme in the novel. The extent of the colonial aspect of the novel has of course been fiercely debated, in particular since Edward Said’s references to it in Culture and Imperialism (1993). Some critics have demurred about making the perhaps too-easy equation between actual slavery and the domestic tyranny endured by white middle-class or gentry women in Austen’s day, while others have pointed out that Austen’s own contemporaries on both sides of the political spectrum, including Mary Wollstonecraft and Hannah More, enthusiastically made use of this direct comparison themselves (Coleman 293, 297). Austen’s subtlety may forbid her from directly making such an equation—either in the exchange in Emma between Jane Fairfax and Mrs. Elton about the governess trade and the slave trade (325), or in the very pregnant silence about the subject in Mansfield Park itself (231). Nevertheless, it by no means prevents Austen from being aware of such a comparison. While neither the novel nor the painting is “about” slavery, both evidently allude to its effects and probe the uncomfortable realities of inequality, power, and obligation concealed beneath the smooth surface of family representation. Is it therefore possible that Austen saw this portrait, perhaps knew about Dido’s story, and brought the ramifications of this complex family situation to bear on her creation of Mansfield Park? We know that she sought visual models for her characters in portraits—at least after she had created them—and in a letter to Cassandra of 24 May 1813 she described how, when she visited an exhibition, she found a “Mrs Bingley” though not a “Mrs Darcy” among the portraits. Several essays, including that by Janine Barchas in Persuasions 31, have discussed Austen’s knowledge and appreciation of visual art, and it is of course in these terms that she characterizes her own skill when she writes to James Edward Austen about “the little bit (two Inches wide) of Ivory on which I work with so fine a Brush” (16-17 December 1816). Mansfield Park does not (like Emma and Sense and Sensibility) have a heroine who draws, but, as Barchas points out, Fanny provides a home for unwanted family portraits (145) in the East room. Austen is highly likely to have visited Hampstead, since her aunt Philadelphia Hancock and her cousin and sister-in-law Eliza Austen and Eliza’s son were all buried there (Le Faye 417, 603). On 24 May 1813 Austen recorded that her brother Henry “talks of a drive to Hampstead,” and in “The Beautifull Cassandra” she sends her heroine to Hampstead by Hackney coach (55). Kenwood itself was widely visited in Austen’s day, on account of its Adam brothers’ architecture and its connection with Lord Mansfield. In his diary for 17 April 1776 the American loyalist Samuel Curwen described viewing the interior of Kenwood and its portraits (56), and on 22 June 1792 Austen’s admired fellow-novelist Fanny Burney visited the house and was shown round by the housekeeper: “We went to Caen-wood, to see the house and pictures. Poor Lord Mansfield has not been downstairs, the housekeeper told us, for the last four years; yet she asserts he is by no means superannuated, and frequently sees his very intimate friends, and seldom refuses to be consulted by any lawyers” (2: 464). A similar scene is, of course, crucial to the plot of Pride and Prejudice, when Elizabeth and the Gardiners are escorted round Darcy’s Pemberley in his absence by the aptly-named housekeeper Mrs. Reynolds (273-77). Burney particularly noted the paintings at Kenwood, and it is likely that this portrait was in the house a decade or two later, when Austen might have visited, since it was still there in 1898.3 Unfortunately the archivists for Kenwood and at the Mansfield family’s current seat at Scone can trace no extant visitors’ book for Kenwood, with a carefully-enscribed “Jane Austen was here.” This part of the evidence must therefore end with a question mark: but the possibility that Austen saw the portrait and brought its tensions to mind in writing Mansfield Park remains an intriguing possibility. 1. Portrait of Dido Elizabeth Belle and Lady Elizabeth Murray (by an unknown artist, formerly attributed to Zoffany), from the collection of the Earl of Mansfield, Scone Palace, Perth. Reproduced with the permission of the Earl of Mansfield. 2. John Wiltshire and others have suggested that Austen’s source for the title was the character Sir Thomas Mansfield in Samuel Richardson’s Sir Charles Grandison (Wiltshire 306). Given the care Austen took in choosing resonant names from real life as well as from literary works (see Barchas 147-49), however, this seems rather less likely than a reference to the famous judge. 3. Email to the author from Dr. Mary Young, Archivist to the Earl of Mansfield (5 Feb. 2009). I am most grateful to Dr. Young and Allison Sharpe, Curator (Collections), English Heritage, for their help with and interest in this project. Adams, Gene. “Dido Elizabeth Belle: A Black Girl at Kenwood, an Account of a Protégée of the 1st Lord Mansfield.” Camden History Review 12 (1984): 10-14. Austen, Jane. The Cambridge Edition of the Works of Jane Austen. Ed. Janet Todd. Cambridge: CUP 2005-08. Burney, Frances. The Diary and Letters of Madame D’Arblay (Frances Burney) with notes by W. C. Ward. 3 vols. London: Vizetelly, 1891. Coleman, Deirdre. “Imagining Sameness and Difference: Domestic and Colonial Sisters in Mansfield Park.” A Companion to Jane Austen. Ed. Claudia L. Johnson and Clara Tuite. Chichester: Wiley, 2009. 292-303. Curwen, Samuel. The Journal and Letters of Samuel Curwen, an American in England, from 1775 to 1783, with an Appendix of Biographical Sketches. Ed. George Atkinson Ward. Boston: Little, 1864. Hutchinson, Thomas. The Diary and Letters of His Excellency Thomas Hutchinson Esq. 2 vols. Boston: Houghton, 1884-86. Lawrence, Rachel. “Jane Austen’s Elegant but Dumb Ladies.” The Inkwell (2002). 23 March 2010 http://www.jasnanorcal.org/ink7.htm. Oldham, James. “New Light on Mansfield and Slavery.” Journal of British Studies 27.1 (Jan. 1988): 45-68. Pliny the Elder. Natural History. Trans. John Bostock and H. T. Riley. London: Bohn, 1855. Said, Edward. “Jane Austen and Empire.” Culture and Imperialism. London: Chatto, 1993. 95-116. Slavery and Justice: The Legacies of Dido Belle and Lord Mansfield.” Exhibition brochure. London: English Heritage, 2007. White, Gabrielle D. V. Jane Austen in the Context of Abolition. Basingstoke: Palgrave, 2006. Wiltshire, John. “Decolonising Mansfield Park.” Essays in Criticism 53.4 (2003): 303-22.